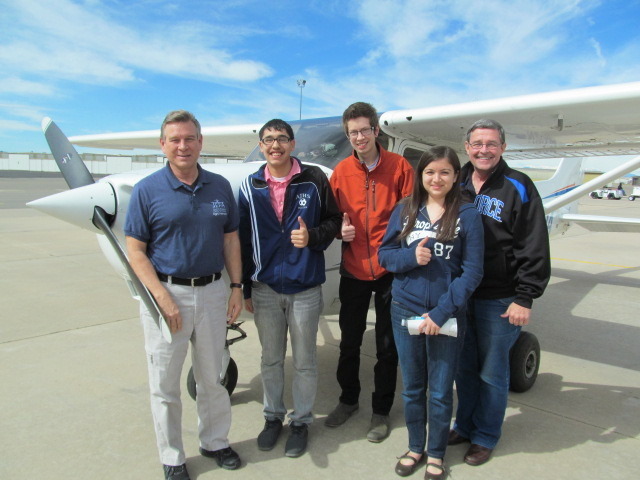 Three students from Arrupe Jesuit High School in Denver recently experienced the thrill of flight with Jeppesen Employees Flying Association pilot Mark Smith in a Cessna 172. During the half hour flight from Centennial Airport, the students took the controls and had the chance to actually fly the airplane. Arrupe Jesuit serves economically disadvantaged students from Denver’s inner-city neighborhoods. The students participate in the Corporate Work Study Program which provides students with real world job experience while allowing them to earn a large portion of the cost of their education. In partnership with local businesses, the students fill entry level clerical positions and are available to work one day a week in addition to their school schedule. The Arrupe students work in the Global Navigational Services and Finance departments and are mentored by Jeppesen employees. This partnership, in its inaugural year, has been successful for both the students and the company. Posted on April 22, 2013 in Community.